The layout has been tested and appears to work fine, but the module itself has some problems that I now need to work out Regulators and pass transistors all on one side - use insulators and attach to a single surface for easy mounting. There are a few prototype boards left that I'll sell from my website. Ooooh red board is nice too though Where do you get those made? Gold Phoenix. Kinda brash and not as cool as your black boards though. Also a boring layout compared to your SSL. Hey, meant to say thanks for your inspirational PCB design post! OK, nice to know others need the same kind of board. To get regulated -24 +24V do you use a -24 0 +24 transformer with this ? Or is there some voltage doubling going on? Wow thanks Mnats. I've always been quite an admirer of your work too. on my lab supply but didn't have the brain to go "put one of those on the GSSL". stuff apart - why the double emitter follower? Interesting. Very nice. I just threw in a JLM powerstation in my empty 900 rack but this is a nice little beast. I also took off all those terminal strips at the back, drilled out holes, and put 1/4" jacks on nearly everything (I think it was 2 TRS and 2 TS) in my 900 rack. Now I just need to put something more in it than 2 DBX 903s! I'd like to put some of JLM's compressors in there. To get regulated -24 +24V do you use a -24 0 +24 transformer with this ? Should be OK with minimum 40V center tapped so yeah, two 24VAC windings will be fine. Just make sure the regulators get bolted to something big enough. Or is there some voltage doubling going on? Check the schematic - no charge pump in this baby. BTW, your board shipped today. I'm just a dumb repair guy and the schematic is basically just copied from the FS900. Not following your next question - there's the Darlington pass transistor (Q1, Q3) and a couple of TO-92 packages (Q2, Q4). The Darlingtons do the heavy work while the smaller ones sit there looking at the current through the resistors near the outputs. When things get too hairy (like a short circuit), they turn on to limit the current thorough the Darlingtons and save you some money. Someone else could probably give you a better description! Ah I see, there's a schematic in there as well....thought they're only pcb layout pics..Thanks. >>I'm just a dumb repair guy and the schematic is basically just copied from the FS900. Do I know that from somewhere? Just received my psu board. Again, very well made. Thanks a lot Mnats, also for the extra little psu board. Very generous! Great! Hope you find it useful. I should add that it is simple enough to change the voltages on the regulators to whatever you need so the board will work in any application where you need four voltages from one CT transformer. exactly what I was looking for !!!! I just paypaled you for one board !!! Thanks. "Various disguises are regrettable but necessary, if you want to make it through the day !" received the board quickly !!! Thanks a lot for this effort and the additionnal board, very nice of you ! Keep up the great projects ! Thanks, Piotr. To mnats or anyone who has used the FS900... Will it put out 1000mA on +-15V rails? Look at the data sheet for the regulators: "1.5 A, Adjustable Output, Negative Voltage Regulator". But if your transformer won't deliver 1A then there's no chance the circuit will. And can I run it without the 24V section? I'd like to house my own DBX 903 module using this PCB as the power supply. But I am confused on what type of transformer I need to use. Where could I find more info about this? 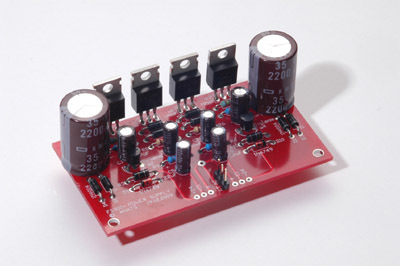 I just built this psu and while it gets me good voltage readings unloaded, as soon as I connect it to the modules, the LM317 and 337 regulators overheat and the thing shuts down. The DBX 905 modules work fine in a DBX rack. I'm using a 30VA Dual 24V transformer. I did substitute the MPS8098 and MPS8598 with MPS2222 and MPS2906. Could that be a mistake? now this one doesn't work either, I'm a bit confused. You didn't say how many modules, and what. Go find the current draw from the DBX manuals, and tell us how much current is being drawn. Then we can guess if there's a problem, or if it simply needs more/better/any? heatsinks on the regulators. If overheating, that would be the first thing to suspect, not knowing your build. so thats 100mA on each 15V rail, and 30mA on each 24V rail. I didn't think they'd need much heat sinking. The transformer is dual 24V. dbx 900 series 1U rack unit??? dbx 900 series rack ?